A new mini-version of our great EZ Gripper Vinyl Jar Openers is our 3-inch Round Mini Bottle Openers! These Bottle Openers are made from the same material as our EZ Gripper Vinyl Jar Openers that are softer and stronger than our Rubber Jar Openers – gentler on the hands – yet provides superior gripping power. Proudly made in the USA! With our Nail Polish Bottle Openers, no small bottle will be too difficult to open! These mini Bottle Openers also make opening water bottles easier than ever and are convenient enough to carry in your pocket. Imprint Colors: black, reflex blue, red, green and burgundy. White ink available on dark vinyl colors. The same great Mini Bottle Openers now can be ordered as Mini Grippers To Go. 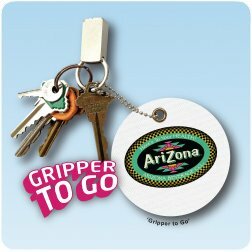 Mini Gripper To Go is great for key rings or backpacks. 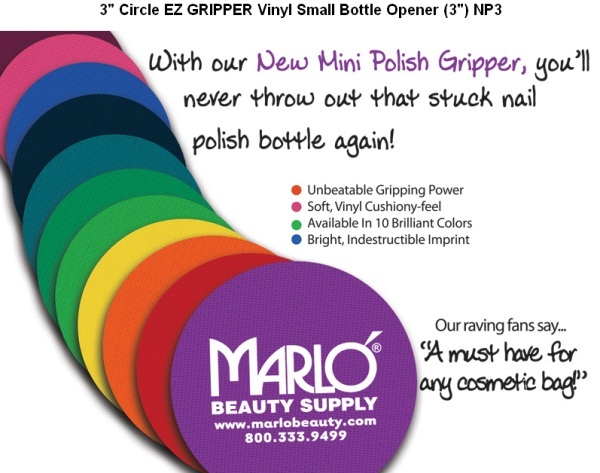 Same great vinyl material used in our Mini EZ Gripper Vinyl Nail Polish Bottle Openers. Eyelet and chain are included (some assembly required). Mini Gripper To Go is 3″ diameter with an imprint area of 2-1/4″ circle diameter.